Edmund Morris had dreamed for many years of moving to the country, reading all he could about farming and taking a keen interest in anything agricultural. His city life had had its ups and downs and although close to bankruptcy on more than one occasion he had managed to settle his affairs and resolved to quit the city before things got any worse “the whole business horizon seemed full of coming storms, which burst successively with desolating severity”. He was under no illusions; farming would be hard work and was unlikely to make him rich, but he believed strongly that it could be made to keep him and his family comfortable and in control of their own destiny. 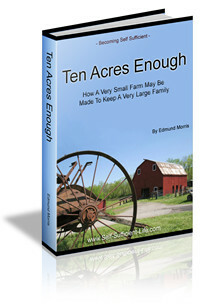 ‘Ten Acres Enough’ is Edmund’s personal account of his journey – successes and failures. Many years have passed sinced it was written, but it still contains many useable self sufficiency hints and tips from his experiences and remains a ‘classic’ and inspirational self sufficiency book. File Size : 2.74mb approx.